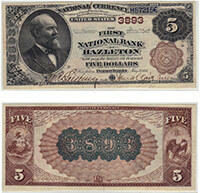 Only four territorial national banks even issued money like this. As you can imagine, such a high denomination was rarely needed for day to day use. The collecting world has yet to document a survivor; although odds are that one will eventually be found. The value of that first discovery will be based on the bank of issue and condition. Please contact us for details.